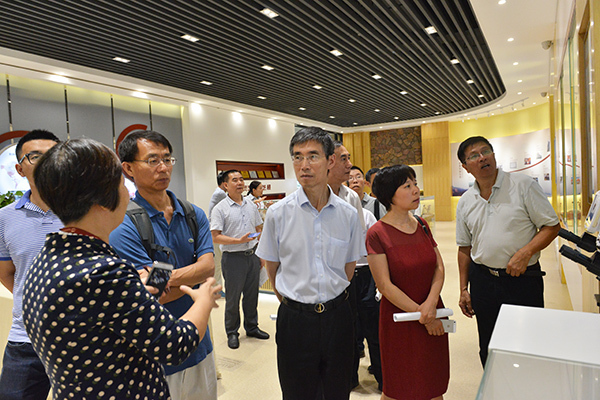 On August 28th, a group of 11 experts from Association des Scientifiques et Ingenieurs Chinios En France (ASICEF) went to Fujian GANOHERB Group to conduct research and exchange activities accompanied by leaders from Fujian province, Fuzhou municipality, and Haixi High-tech zones. Li Xiaoyu, vice president of GANOHERB Group, and Wu Changhui, General Engineer, warmly received the expert delegation. In GNOHERB Cultural Exhibition Hall, Vice President Li Xiaoyu introduced the extraordinary journey and achievements of GANOHERB in the past 29 years. The experts of the All-China Science and Technology Association expert group praised the management quality of the whole industry chain quality, the product superiority and the brand reputation of GANOHERB. Zhang Yongmin, a French national academician who is committed to scientific research on anti-tumor drugs and diabetes drugs, said with emotion: "I didn't expect GANOHERB to do such a meticulous basic scientific research on Ganoderma Lucidum ." With a scientific and rigorous attitude, GANOHERB has been following a road of professionalism, dedication, and ingenuity. It is reported that Association des Scientifiques et Ingenieurs Chinios En France (ASICEF) was established in 1992. It consists of Chinese scientists and technicians in France. It gathers the scientific and technological elites who stay in France and are now returning to China to find opportunities for cooperation with domestic enterprises. During the visit, the two sides conducted in-depth exchanges on scientific research investment, school-enterprise cooperation, product research and development, pharmacological research, etc. ASICEF indicated that the Reishi Mushroom health industry is a major project that benefits the country and the people, and it contains huge market benefits and social benefits. Both sides will actively explore possible future cooperation directions. Scientific and technological innovation is the primary productive force, which determines the vitality and development of the enterprise. Since its establishment, GANOHERB has been regarding technological innovation as the core link of enterprise development, and it is also the core fulcrum of the company's stable market in the past 20 years. GANOEHRB has also achieved fruitful results in the field of scientific research and innovation in recent years. In the future, GANOHERB will continue to maintain the true nature of high-tech enterprises, continue to increase scientific and technological innovation and cooperation on the industry, the academia and the research, and strive to boost "Magic Herb" Lingzhi to enter the ordinary people's home through the express train of modern high-tech development.